A Midsummer Night's Dream ~ "An enticing blend of cypress and rose that evokes the supernatural beauty of woods cloaked in the luminous glow of moonlight." As You Like It ~ "Dismiss melancholy and let life affirming spirit triumph with an enlivening blend of green tea, oasis and vetiver peat moss." Much Ado About Nothing ~ "Let love in. Lily of the valley, green fig and vanilla cream conspire to help you overcome the barriers you've built within yourself." Romeo & Juliet ~ "The intensity of young love beckons with the sweetness of coconut and bambu while lilies add a touch of romantic sophistication to thwart fated tragedy." The Tempest ~ "Amber and indi [sic] sandalwood are earth confined elements but together they become other-worldly. We ourselves are such stuff as dreams are made on." 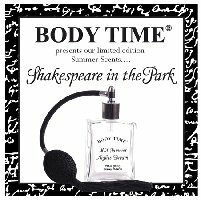 The Body Time Shakespeare in the Park fragrances are available in 10 ml roll-on, 30 or 60 ml, concentration unknown. Interesting. Not sure if I relate to the notes in The Tempest. They do not match my impression of the story. Liking the sound of A Midsummer Night’s Dream. I hope I get to try them when I visit the States at the end of the year. They’re in Berkeley, not sure you can find their products anywhere else, unfortunately! I like some of their products very much, but it’s not easy to try them. ladymurasaki, I agree. Those notes don’t say “The Tempest” to me, but then I don’t associate coconut with Romeo and Juliet, either! The first three seem more closely associated with the themes or settings of the plays. Interesting idea, though – I wonder what they’d do for Twelfth Night or Macbeth. There is a new family that owns Body Time now..they came on board about a year or so ago..I’m glad to see that they’re expanding the offerings. I’d love to try these! Thanks so much, I didn’t know that! Maybe they’ll expand distribution too.